A multinational producer with horizontal well pads targeting the Montney formation in northeast British Columbia was looking to achieve tighter stage spacing to better exploit the tight dolomitic siltstone. They wanted to run a cemented completion to avoid relying on mechanical packers for stage isolation, and were looking for a more efficient, cost-effective and reliable stimulation operation than what coiled tubing methods allowed due to the target depths. The operator chose to run Tartan’s cemented EnerFrac™ single-entry ball-drop system and Cemented Initiation Sub (CIS) technology based on the simplicity and demonstrated reliability of the tools. The CIS is used to reliably initiate stimulation at the toe and both the CIS and EnerFrac™ sleeves feature BurstPoint™ ports that keep the system internals completely closed during installation and the cementing process. This eliminates the risk of cement invasion into the sleeve mechanism, enabling trouble-free stimulation operations. The patented EnerFrac™ hydro-mechanical sleeve is activated by a ball and designed to stimulate individual stages at high rate. Once the EnerFrac™ sleeve is shifted by an actuation ball, communication with the formation is achieved by increasing liner pressure to fully open the patent-pending BurstPoint™ ports. This instantaneously releases the energy stored by the hydraulic pressure in the tubing to provide a more penetrating treatment, resulting in a deeper fracture network and increased production. 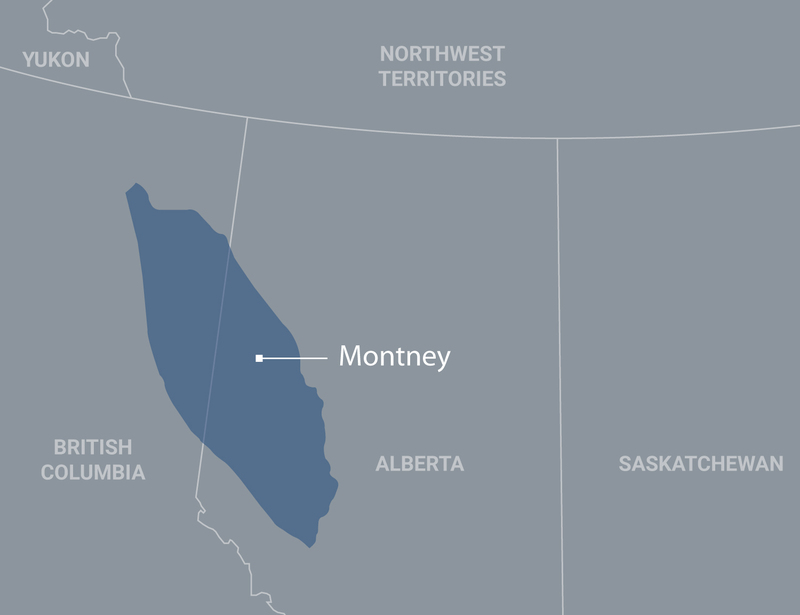 A 26-stage cemented EnerFrac™ system was run in the Upper Montney well and a 29-stage system was used to target the Lower Montney formation at 175 m deeper. Both systems used 139.7 mm (5.5 in. ), 29.76 kg/m (23 lb/ft), P-110 LTC liners. The cemented EnerFrac™ system design enabled quick and easy installation compared to an open hole completion with packers. The total proppant pumped per stage was 125 t for the Upper Montney and 110 t for the Lower Montney well (see job summary). The “on-the-fly” ball-drop operation also enabled quick completion of the well stimulation, resulting in increased efficiency and reduced costs. Savings of approximately $250,000 per well were achieved compared to open hole completions in the same field.